Are you looking for ways to help your middle and high school friends raise $ for summer camp? Here's a link to The 10 Best Camp Fundraisers. One of those 10 ideas is to do a Young Life Yard Sale. Below are 15 tips to help you pull it off! Find a Great Location. Something that is visible, near a main road, possibly a church parking lot or the parking lot of a business that isn't open on Saturdays. Some residential neighborhoods can also work well, but location is key. Publicize well. Make simple posters and hang them up around town with the address and date of the sale. Hang them up on Wednesday, three days before the sale. Make a fun "Insta square promo" and ask everyone you know to share it on social media. Post it on Instagram, Facebook, Twitter, Craigslist, YardSales.com, and NextDoor. The morning of the yard sale, have everyone that is working share an Insta story or a live video of the event. Keep it simple. 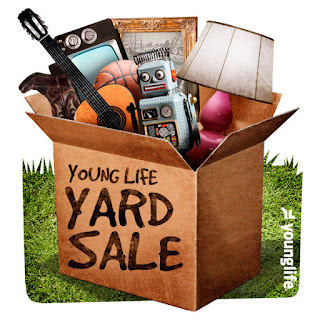 Instead of collecting stuff for weeks ahead of time, just ask students and families and YL friends and committee members to bring stuff over on Friday evening or early Saturday morning. Make sure you have lots of stuff to sell. This is the key. More stuff = more money! Ask friends, churches, neighbors, family, friends and everyone you know if you can come by on Friday afternoon and collect their junk to sell the next day. Bigger, Better, Best. A fun way to collect lots of bigger ticket items is to play "Bigger, Better, Best" the week before at club. Don't Price Anything Ahead of Time. It will be too complicated and time-consuming to put price tags on everything. Just negotiate with buyers on the prices on Saturday morning. All campers who work the sale get an even share of the revenue- do it this way because often the students who have the least “stuff” are the ones who need the most money for camp. Get change. Go to the bank on Friday and get $40 worth- split up in quarters, $1s and $5s. Wear an apron for a money holder and get a money box or purse to keep the money safe. Get blankets and tables. Borrow tables from friends or churches and make sure you have enough blankets to put everything on that's for sale. Start early in the morning. Yard sale shoppers are crazy people and typically get going by 6:30am. Ask kids that are working the sale to arrive no later than 6am and begin organizing stuff as it arrives. Parking. Make sure all the students that are working the yard sale park far away to leave room for customers to have places to park. Servant's Hearts. Remind the workers to have helpful attitudes, to engage with customers, and to help offer to carry things to their cars. Snacks/drinks. Sell Krispy Kreme doughnuts, lemonade, coffee and other snacks. Parents will often be willing to make baked goods to sell as well. Make sure people know it's a camp fundraiser. Have signs that let folks know it's a charity yard sale and also have a large container for donations. Worker Uniforms. You can ask all the kids working to wear a YL shirt, and if you have extra shirts from camp, they could all wear the same one to be easily identified by customers. Name tags are also a nice touch. Goodwill Drop pre-arranged. Ask a couple parents with trucks or vans to plan to take all the leftovers to Goodwill at noon. At 11:30am, make everything free and let kids take home anything they want. Using this model typically results in about $100/kid who helps at the sale! Thanks to Elisabeth Bishop and Valerie Sagero for sharing these helpful tips! If you have other tips to add, email us here and we'll add them to the post.